I almost had to slap myself to see if I was dreaming when the New York Rangers scored 4 goals in the 2nd period (3 in just over a minutes time). 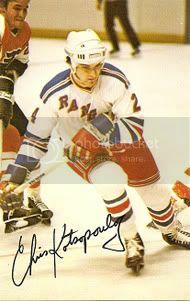 The goal explosion led to a 7-4 win over the Columbus Blue Jackets on Monday night at MSG. It certainly took everybody by surprise, especially since the Rangers have struggled to find the net lately. I don’t give a damn what others might say. The Rangers needed this win in a huge way. When the Blueshirts fell behind 2-0 in the 1st period things were looking a bit grim. This is where I tip my hat to Coach John Tortorella for taking a time-out! At first, I thought a major blasting was about to happen, but that did not occur. Torts came out and kept it real calm and spread encouragement instead of fire. Good job, Torts! From there, Marian Gaborik went to work and the rest of the Rangers followed in turn. 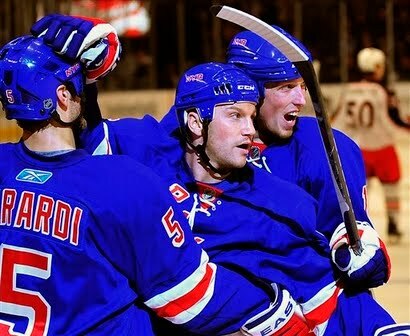 Gaborik, Anisimov, and a beautiful solo rush by Del Zotto gave the Rangers a lead that they would never relinquish. At this point, I was really impressed with how the Rangers had rebounded from a 2 goal deficit to grab the lead. It’s not easy on any day in the NHL, let alone when you have been struggling to find scoring from anybody (other than Gaborik and Prospal). In the 2nd period, the boys in blue went wild. Avery scored twice and Gaborik picked up his 2nd goal in a flash to give the Rangers a much larger, 6-2 lead. 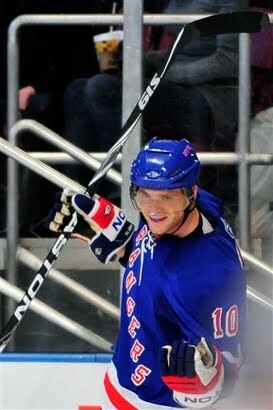 Matt Gilroy then made it 7-2 for the Rangers on a nice breakaway move. That’s right, a breakaway from a d-man- it was nice to see! The Jackets scored a few more to make it look good, but really this game was more than over. A couple of things that should not go unnoticed… Aaron Voros gets a lot of criticism by many Rangers fans and I in the past have been one. This year, he’s done everything for the team that you could ask for. He answered the big hits on Marc Staal by taking on Jared Boll when the game was out of reach for the Blue Jackets. I like that. It shows team spirit and to tell you the truth, he did very well in the fight against a rather tough opponent. Voros is what he is. But one thing’s for sure, he’s a team player (more Rangers players could learn from him). The other is Henrik Lundqvist once again gets run over by Rick Nash and all you do is grab a hold of him? 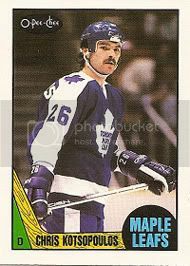 How about throwing him to the ice (like teams do to the Rangers)? Or how about taking a 5 minute major to get a point across that it’s not acceptable and that it has to stop? Lundqvist needs to be treated like a fine piece of art. No one and I mean no one should even get close to him without paying for it. There, I vented a bit but it needed to be said! Now on to the Quinnipiac Bobcats (Now ranked #9 in the country). They won 2 games over this past weekend at Colgate and Cornell (5-3 and 3-2, respectively). I believe this team has the goods this year and they are making believers with each game that they play. Good job fellas and keep it rolling! Over and out! It seems like we’ve been here before, haven’t we? 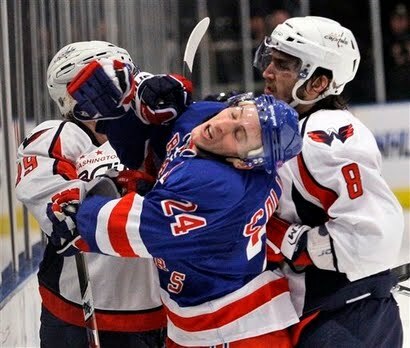 The New York Rangers dropped to 11-9-1 with a 4-2 defeat at the hands of the Washington Capitals last night at MSG. I’m not going to go over the game in much detail, but there is one thing that bothers me about this contest. I can accept losing the right way. What I can’t accept, at all, is losing the wrong way. Last night’s game came down to a terrible pinch-in with just under 5 minutes to go in the 3rd period during a 2-2- tie. 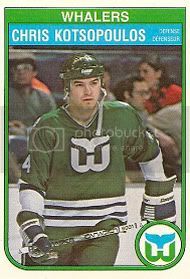 The bad pinch was created by defenseman Wade Redden and what ensued was the go-ahead goal by the once bloodied Matt Bradley, of all people. Sorry, but this was a dumb decision by Wade Redden. You have to play it safe in a situation like that. There’s no excuse. Another thing that I was kind of shocked about was that Matt Bradley actually outskated Matt Gilroy down the ice to roof it over Lundqvist’s shoulder. In my opinion, this game should have went to OT and possibly another shoot-out. Unfortunately for the Rangers and their fans- valuable points were denied. Now the Rangers find themselves struggling to stay afloat at the .500 mark. The other teams in the Eastern Conference continue to win on a regular basis and with games in hand over the Rangers, things are getting tight. To beat a dead horse, the players need to take it upon themselves and be responsible for their own play. It can’t be just Gaborik night after night (which it has been for a while now). I still believe the talent is there, the question is will the talent live up to the expectations? Let’s hope so. Over and out! *Just a side note, I will be away this weekend to do the color commentary on the radio for the Quinnipiac Bobcats Men’s Hockey Team (who are now ranked 13th in the country). They are playing 2 road games at Colgate and Cornell with the man himself, Bill Schweizer calling the play. Feel free to check them out! It’s time for the players to understand that this is a team and these are your teammates that are getting hit! The Drury situation really bothers me. The hit by Glencross was cheap and nasty- period. The hit was very early in the game and there was about 59 minutes or so of hockey left to be played. Yet, there was no response by the Rangers as a team. Sorry, but Glencross needed to be dealt with sometime before the game ended. The Rangers find themselves being the target of most of the big hits, rather than being the ones that are dishing them out. It’s time for a pack mentality to set in for the Rangers and they have to stick up for one another. If not, this kind of thing will happen again and again. Now, on to the other part of the problem: The NHL’s rules. The NHL thought it would be neat to take away obstruction-type plays and place the instigator penalty for those who felt like taking the law into their own hands. I wonder if the NHL has taken a hard look at how common it has become for hits from behind and head shots since they tried to “clean up” the game. More and more players are getting plastered all over the ice and I think I have a few thoughts that might make them re-think a few of their cherished revisions. First off, obstruction. What a joke that has been. It hasn’t opened up the game or given the NHL that huge explosion of offense that it was supposed to create. What it has done has gotten the players in trouble with hits from behind at high speeds. In my day, we would shield a player just enough so that kind of play rarely happened. I’m not saying reach and extend your stick to obstruct, what I’m saying is to let the players slow down an opposing player who is coming at a high speed and chasing a defenseman/forward for the puck. 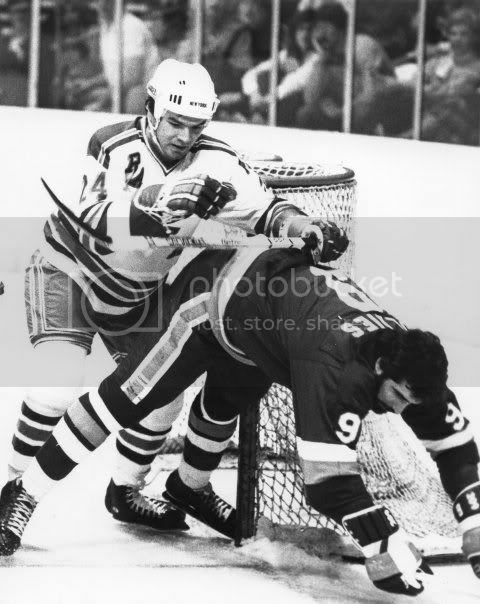 I don’t recall as many hits from behind in the “good old days” as there are in today’s NHL. 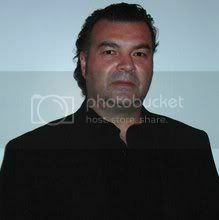 As for the headhunting that is surfacing, that has a lot to do with the lack of respect that the players have today. There is no payback with the instigator rules in effect and the huge fines that hit the players and organizations in the pocket. I would definitely think twice if I had to pay a huge fine and possibly be suspended. We used to police our game by ourselves back when I played and believe me, if you had the balls (which some did) all hell would break loose! Overall though, headhunting was not quite as evident as it is today because there is no payback. Therefore, there is no respect amongst your peers. The NHL has had a lot to do with all these cheap shots and injuries that have been occurring. Constantly trying to “improve” the game is noble and I’m all for change when it works out the right way. But it takes a big man to admit when they are wrong. Do you think the NHL ever will? Enough is enough! Over and out! In the second game of a 3-game Western Conference swing, the New York Rangers bounced back with a 4-2 victory over the Edmonton Oilers. After dropping a 4-1 tilt in Vancouver to open the road trip (a game, by the way, that was tied 1-1 with 10 minutes to go), the boys in Blue came up with a great team effort with Steve Valiquette tending the net. A couple of things that I took from this game... first, the PP. What a weapon it can be when it's firing on all cylinders. With 3 goals coming by the way of the PP courtesy of Ryan Callahan, Ales Kotalik, and (guess who?) Marian Gaborik- I think it proves my point. Also, it was nice to see Christopher Higgins pop another goal. I had him penciled in for 20-25 goals this year and boy we all know that the Rangers need to find some scoring to go along with Gaborik. It was also important to see Valiquette give Lundqvist a rest and come up large with a win. Good job! It's not easy being a back-up to a goaltender who plays 80% of the games. On the negative side, boy I wish the Rangers had more team grit. I just don't understand why is it that most teams out hit and play more physically than the Rangers. “Soft” is a word that is used too often, but in this case? Well... Even coach John Tortorella wants to see this team be "harder" to play against (Harder is a nice way to say it). Oh well, nice bounce back win for the Rangers. Now it's off to Calgary where the Rangers are going to have to pick it up another notch or two to beat the Flames. Hopefully the Blueshirts can end this western road trip in style. Over and out! Well, that's more like it! The Rangers were all healthy and back to their usual selves. 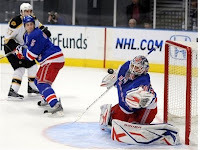 The King played like The King and Marion Gaborik took care of the only goal scored as the New York Rangers defeated the Boston Bruins in a Sunday matinee at the Garden. The timing of this shutout for Lundqvist was perfect considering the 50th anniversary of the goalie mask being introduced by Jacques Plante. The Rangers, as a team, really needed this one! It was very nice to have Gaborik back from his injury today. Gaborik's goal was typical Gaborik. A quick release and it's in the back of the net. He gave no chance for Tim Thomas to set up. Also the great penalty killing today by the Rangers was to be applauded. The Rangers killed off all 5 PP's today that the Bruins had. 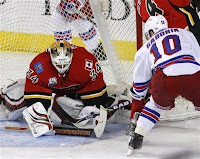 The Rangers also needed a game like this from Henrik Lundqvist and he most certainly delivered. Good job all around! Now it's on to Vancouver and the West Coast for some late night hockey (for us East Coasters). Over and out!